General Motorcycle Discussion / Re: helmet A/C? Oooo, perfect for Corona lol! All I need now is one for my jacket and gloves and I'll be happy! A fun casual ride from the Dainese Orange County Store to the Lookout Roadhouse on Ortega Highway. Meeting at the Dainese factory store(1645 Superior, Costa Mesa, Ca.) at 8am. Coffee and Donuts until 8:30am, then kickstands up. The Ortega ride is a beautiful windy 2 lane highway through the canyons that lead up to a small local spot with a majestic view. From there riders are on their own to find their own destination. 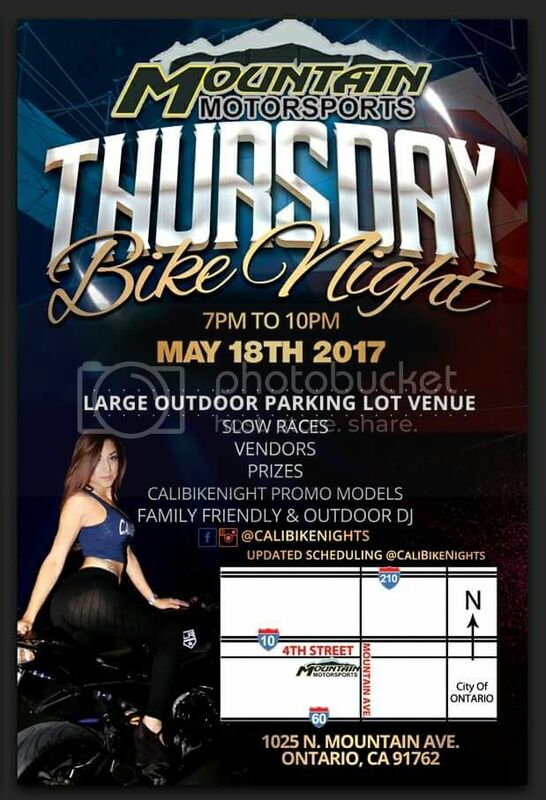 BIKE NIGHTS ARE BACK! January 25th, join your favorite Cycle Gear team for some fun, games, food and free Shwag provided by us and our vendors that will be attending! Hope to you there! Come hang out with all your favorite Supercross Riders! We will be doing Raffles and having giveaways and great deals. IT will be a really fun night for you and your friends and family. We look forward to seeing everyone there! Looking like we are going to have a full house!! Kicking off 2018 with HOOTERS BIKE NIGHT!! DEEPEST CLUB TROPHY 10 OR MORE PATCHED MEMBERS. Hang out with the Hooter Girls!! You never know who is gonna show up!!! DJ BOBBY B IN THE MIX!! Now’s your chance to ride the 2018 KTM Street product line. From the redesigned 390 Duke to the all-new 1290 Super Adventure S, the Ride Orange Street demo has the KTM Street Bike for you. Sunday, January 7, 2018, at ONE ICON, FOOTHILL RANCH, CA 92610. The best part, participants will receive a KTM VIP Card worth $500 in KTM Powerwear, Powerparts, or Spare Parts with the purchase of a new KTM motorcycle. Everything's official. Hope to see you at Lucky Wheels Garage in LA on Sat, Jan 13th for the third annual Women's Motorcycle Show! ⚡️The raffle is going to be amazeballs (details below)! Huuuge thanks to headline sponsor Bell Powersports! Booze, food, piñata full of awesome adult goodies, live music, art wall and more! We've got Stephen el Rey Sextet on deck for great live tunes to boogie to! Is moto parking free there? Hey Ladies & Gents come to AU79 Tea House in Arcadia to hang out with other bikers for our Monthly Bike Night meet-up. Learn more about bikes, hang out with friends, and grab delicious drinks with a complimentary (cold drink) size upgrade when you say you're with the Bike Night! Please no stunting or doing things that will get us kicked out! If you don't have a bike, no worries, come and support anyway! Hope to see you there! 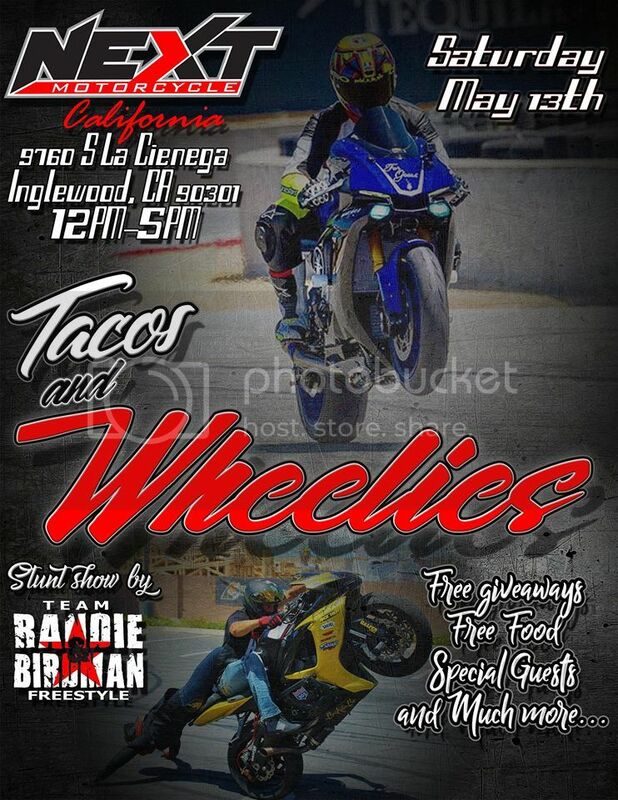 Southern California Truimph (A division of Southern California Motorcycles) invites you to this one-night only V.I.P. event. We will be unveiling the newly redesigned 2018 Triumph speedmaster and the new Bonneville Bobber Black! It's a chance to hang out with fellow enthusiasts and be among the first in North America to see these incredible machines in person. Join us for a fun night of entertainment, activities, sample the finger foods and enjoy craft beers or a cocktail all on us. To attend this FREE event, you must register at the Triumph registration website by January 7th 2018. Come and join us for a day of bikes, food, drinks, and raffles! A MINIMUM OF 200 TICKETS MUST BE SOLD FOR GRAND PRIZE TO BE AWARDED, IF MINIMUM QUANTITY IS NOT MET A FULL REFUND WILL BE ISSUED TO ALL TICKET HOLDERS. 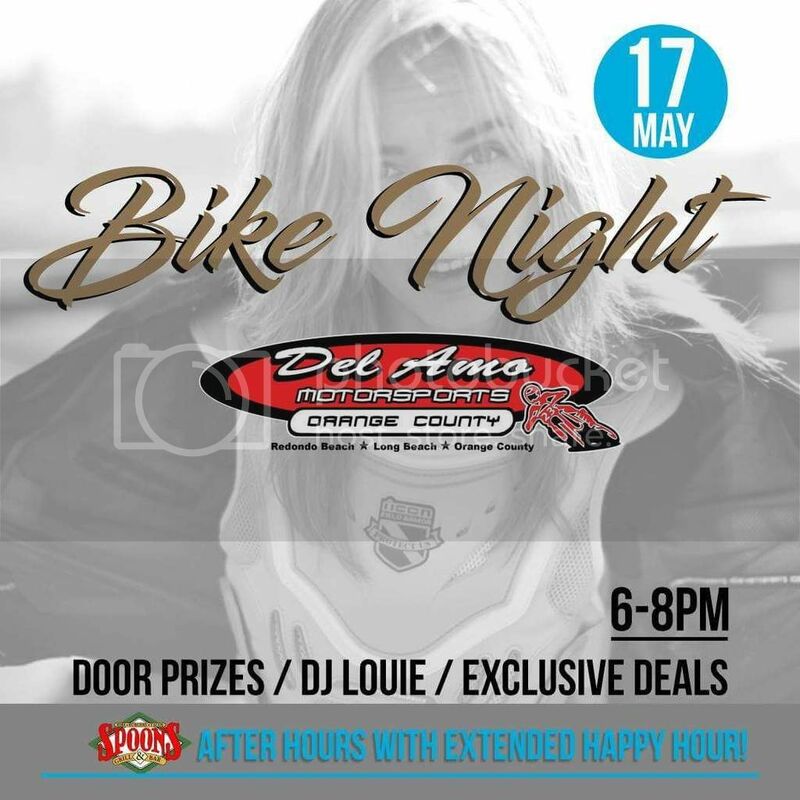 Bike Night Hosted by Watch for Motorcycles "W4M"
Door prizes, DJ and Exclusive deals!